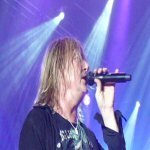 Def Leppard singer Joe Elliott was interviewed by TeamRock radio on 20th April and talked about a secret upcoming show. The possible club show/TV/Online appearance will take place in the USA before the band rehearse for the KISS tour according to Joe. Joe talked about second Down 'n' Outz album, Ian Hunter's approval of the songs, the artwork, the third album, the 2015 Def Leppard album, an upcoming secret pre-tour show and being a producer. Listen to the full 32 minute interview (including full songs) via the link below - Starts at 1hr19mins in until 1hr51 mins in the 2 hour podcast. The host also posted a photo with Joe on twitter recently and as you can see looks very much like Joe's wife Kristine. "The guys came over and we had the month of February put to one side and we worked six days a week. Took Sundays off - no we didn't we took Saturdays off so I could watch the football. We worked Sunday to Friday and we were doing 12 hour days and we thought we might pull three or four songs together and we have got 12 cooking at the moment. Three, maybe even four, but three of which we could release tomorrow." "We're getting back together in May to carry on writing and furthering what we've already written cause some of them are finished. Some of them have just got la la la melodies and no lyrics and some of them haven't even got the melodies yet they're just instrumentals. So we've gotta you know let them simmer and somebody will come in and say I've got this great idea and we'll put it together." "So we're gonna get back together in May for two weeks. Do some more work on the album. Then we're going off to the States for five days to do a secret gig and some rehearsals for the KISS tour that we're doing this summer." "Then Leppard go out on the road for 42 shows towards the end of June through until the end of August and then I'm producing the Black Star Riders album in October and then Leppard are gonna get back together in November to finish the album. So you'll hear some new music from us next year. Hopefully you know I'd say mid to late Spring if it all goes to plan."